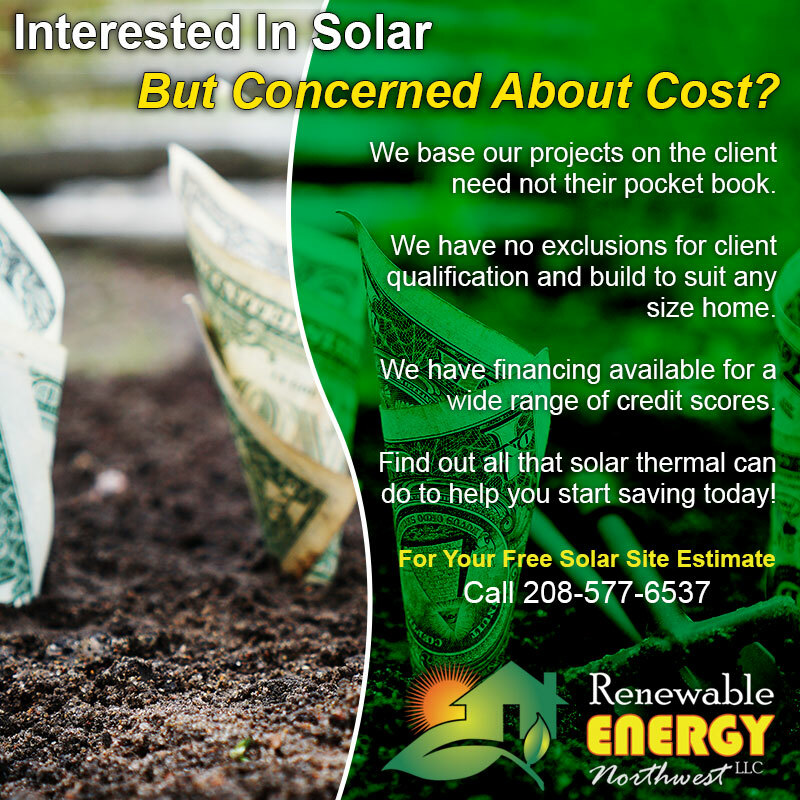 Call For Your FREE Solar Estimate! It surprises us that many people are still not familiar with solar thermal technology and often compare it to traditional solar photo-voltaic. This is especially interesting because solar thermal is actually the older of the two solar technologies! To help dispel some of the common misconceptions about solar we’ve put together this quick graphic so you can see the differences at a glance. Now, this isn’t to belittle solar PV! We have worked with it as an accompanying technology in the past with great success, and we believe it is through comprehensive use of multiple methods that you get the most benefit. The biggest differences between the solar thermal we offer and solar PV is that solar thermal heats the water/liquid directly whereas PV creates electricity which then heats your water. 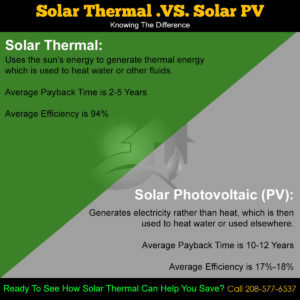 Either one works, but when it comes to water heating solar thermal simply can not be beat! Price too high? Not enough ROI? These are all things we hear when people want to down talk solar and fact is when it comes to solar THERMAL these things are even less of a concern! Fact is, solar thermal from Renewable Energy NW has one of the fastest paybacks of any alternative energy; best of all you will see immediate return in the form of lower energy bills even before the system is paid off! Are there up front costs? Yes! But that’s true of ANY investment. After you’ve already enjoyed years of low energy costs and have your system paid off you can still see more returns should you decide to sell your home – as much as $20,000 in some cases! Ready to start saving? Let’s talk! No Worries Winter With Solar! RENW at the Boise Spring Home Show! Earth Day! Open House Event!